Birth date and place 16 Aug 1834 Newry, Down, Ireland. Physical Description Height: 5 ft. 6¹/8 ins. Complexion: sallow. Eyes: hazel. Hair: brown. Children Mary Catherine b. 1856, Ireland. 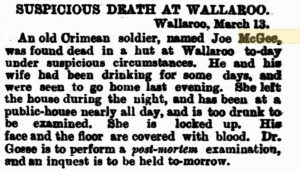 Death date and place 13 Mar 1879, Wallaroo, South Australia. 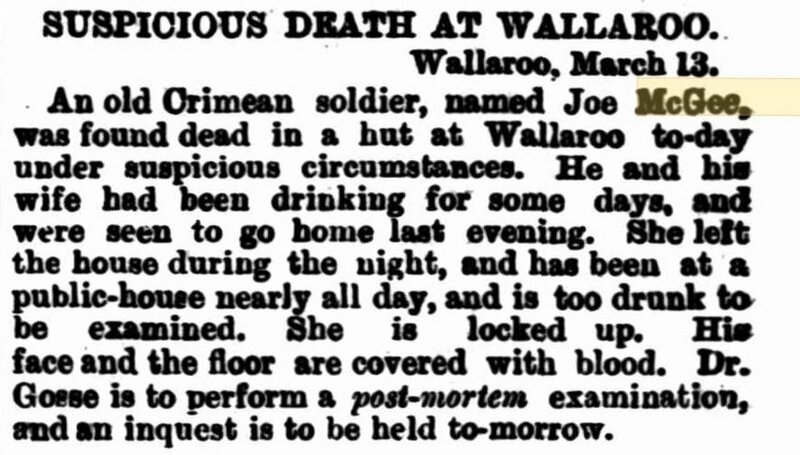 Cause of Death: Serous Apoplexy (Coroner’s Verdict 14 Mar 1879). Burial date and place 14 Mar 1879 Wallaroo Cemetery, Section B, Grave 419, South Australia. Death Notices and Obituaries SA Register 14 Mar 1879. Adelaide Observer 15 Mar 1879. Border Watch 15 Mar 1879. Government Gazette 19 Mar 1879. Adelaide Observer 22 Mar 1879. Regiment(s) Rifle Brigade, 1st Battalion. Regiment No. and Rank #2886 Private. 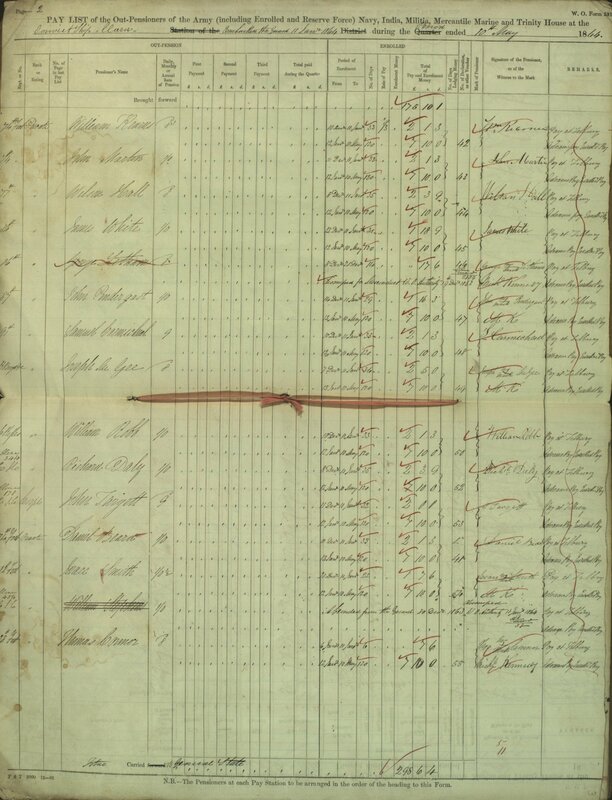 Attestation date and place 15 or 16 Aug 1850 Newry, Down (aged 16 years). Service/Campaigns Cape of Good Hope 2 Jun 1852-9 Nov 1853. Embarked for the East of Europe (Crimea) 13 Jul 1854. 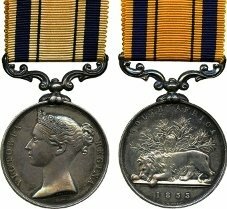 Medals, Clasps and Badges South Africa Medal 1850-1853. Crimea War Medal clasps Alma, Balaklava, Inkermann, Sebastopol. Turkish Crimea Medal. Disabled by gunshot wound of left hand received at Inkermann. Ball paped his outer edge of wrist fracturing carpel when near point of ulna. Discharge date and place 10 Jul 1855 Chatham. Length of Service 2 years 329 days (after age 18). 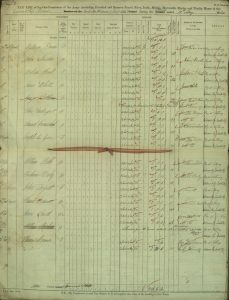 Post Discharge Pension District Newry (1855). South Australia (Sep 1865-Mar 1879). Departure from WA Departed Fremantle 1865 for South Australia – vessel unknown.